We often talk about the absolute necessity of making our books discoverable to readers. I started writing about discoverability as a key to success in online bookstores in 2011. This question most often leads to a discussion about book metadata, a field all indie authors come to understand, if only when they go to upload their book files to a retailer and are faced with a long form to fill out. Metadata is undoubtedly critical to understand and use widely, and will become even more important and book buying continues to move online. But metadata, important though it is, is only one way for your book to be discovered. It helps match up people’s queries, whether using a dedicated search engine or, or a search on a retailer’s site. For instance, if we were to ask an internet marketing expert, she might say that metadata is good, but links are much more powerful. But who in the publishing world talks about creating links to make your book more discoverable? No one I know of. Even if you don’t want to learn internet marketing (but if you want to make money at publishing or as a subject-matter expert, I hope you do!) there are lots of other ways you can make your books more discoverable to the people you most want to see them. This is a great time to brainstorm ideas. If you’ve created a marketing plan for your book (always a good idea) you’ll find an abundance of ideas right in there. But if you approach discoverability with a wide perspective, you’ll find there are lots of ways to get yourself and your book in front of readers. Some will be better than others, but all will repay your investment as long as the individual effort is appropriate for you and your book. 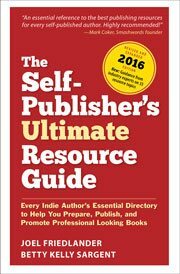 Reviews—This should be a no-brainer for indie authors yet, according to the 2017 BookBaby Self-Publishing Survey, only half of indie authors actively seek reviews. By and large these are free and every review is like gold when it comes to spreading the word about your book. Articles—Whether you’re writing on your own blog, for a media site, or for a magazine in your field, articles do more than get your name and book title in front of an audience, because whoever you are writing for also passes along some of their authority in your field by publishing your piece. Friends—Giving away books is one of the best marketing strategies for indie authors, even though few people could give away as many as 100 copies; they just don’t have enough “reach.” However, think about how many people those 100 people know. That’s the beginning of some great network effects. Other books—Don’t forget to promote your books in other titles of yours, even if they are not in the same genre. Metadata—This is a key for online discoverability, and it pays to understand how metadata—information about your book—works in the publishing ecosystem. Advertising—More authors are using the effective direct-advertising capabilities of sites like Facebook, but for some books targeted online or print advertising can be very effective at raising your profile. Non-book retailers—It’s quite common now to walk into home furnishings store, and find books for sale on decorating and similar topics. Fedex Office has racks of business books. Outdoor equipment retailers stock books of trail walks and outdoor-related activities. This is a big area to explore, but your book in a specialty store will reinforce your discoverability. Counter dumps—Although out of the range of most self-publishers, counter dumps—cardboard cartons that convert into countertop displays—can really create a lot of visibility for your book. Avoid large chains, try this at a local bookstore to see how it works. You may need to “sweeten the deal” by offering a better discount to the retailer. circulars, or catalogs did the store send out to promote their events? If every one lists you, shows your book, talks about your topic, you’ve gained a lot of views. Speaking engagements—Similar to bookstore events, no matter how well or poorly your talk is attended at an event, the promotion around the event is going to help you build discoverability for you and your books. Just the exposure from promotions like these will help improve your books’ discoverability. And if these activities remind you of exactly what you would be doing to build your author platform, congratulations. The two—discoverability and platform—are intimately connected. I bet you can think of lots of other ways to improve discoverability, and I’d love to hear them in the comments. Great article, very interesting! Re: reviews, though, it seems that Amazon is very tough on them: according to their algorithms, if a review you’ve received seems like it might come from a friend or family member, then it may be removed. I chat on several different author forums and this complaint seems to becoming more and more common.